Balto is a 1995 animated film about a half-dog/half-wolf named Balto, who helps save the children of Nome, Alaska by leading a team of sled-dogs carrying vital medicine. The film is loosely based on the true story about the dogs who helped save the town's children from the diphtheria epidemic in the 1925 serum run to Nome. Directed by Simon Wells. Written by David Cohen, Cliff Ruby, Elana Lesser and Roger S.H. Schulman. [Muk is calling for Boris] How sweet. "Uncle Boris." Uh... big paws kinda run in my family. At least.. uh, one side of my family. Steele, I'm not leaving without that medicine. Steele, let me help you. Since when do you need a pedigree to help people? Boris Goosinov is no spring chicken! [gets buried by snow] Is no spring penguin either! Not dog! Not wolf! You are a hero! Oh, bears? Fellas! Idiot balls of fluff! [To Balto] If only your feet were as fast as your mouth. [About Luk] Oh, no! I'm beginning to understand the bear! Balto, I was so scared, I got people bumps! Let me tell you something, Balto. A dog cannot make this journey alone. [He starts to walk away and then looks back] But...maybe a wolf can. He's going into freezing coldness to find a dog he doesn't like to bring back medicine back to a town that doesn't like him. Oh, no! I'm beginning to understand the bear! (as Balto scratches a tree) Good, Balto! You took on the biggest, meanest tree in whole forest, and you won. Who else should you bring on a wild goose chase but a goose? (commenting on Balto and Jenna) I'm seeing a few things too. And it's making the ice melt. (gets splashed by a shaking Luk) I! HATE! BEARS! You're lying. [louder] Steele's lying. Balto's alive. He's coming home. The sun… Ice caps… Balto. [Jenna's bandana is in Steele's mouth] My bandana! I'm afraid the only way Steele notices anyone is if they're wearing a mirror. [To Jenna] You're a hundred percent right, Jenna. I-- I-- wasn't thinking about those children. The important thing here is to get the medicine through. And that's just what I'm gonna do. [to Boris] Frail goose, you a half-breed too, huh? Part turkey? [Aside, to Balto] And when I get back, I'm gonna fold you five ways and leave you for a cat toy. Touch that box, and I'll tear you apart. Go ahead, wolf-dog! You'll never get home! I'll make sure of that. …And I swam and I swam. It was freezing cold. And finally, I said 'Steele, you're just gonna have to gnaw your way to the surface.' So I -- [Balto howls outside] What? [Translating Luk's whimper] Oh, the shame of the polar bear who fears the water. No wonder we are shunned by our fellow bear. Woe is us. [Pause] It's what he said. Kind of pathetic, really. [While walking in the snow] I spy, with my little eye, something beginning with S! Yes, well of course we were! We were in the water! We were moving! We got wet, didn't we… Luk! We were swimming! Sylvie: Say something about her new collar before she gets whiplash. Dixie: [About Steele] He's going to save the entire town. He's positively mag... nesium! Nikki: Oh great, things are not bad enough. Now we got wolves. Nikki: Come on Balto, youse can make it. Dixie: Steele, you are positively dis… posable! Grandma Rosy: Thank you, Balto. I would have been lost without you. Balto: Come on, we don't want to miss the finish. Boris: Oh, that would be a tragedy. Boris: I was being sarcastic. Rosy: [completely elated] I love these rudders! I love this brushbow! I love this sled! Jenna, Jenna! You're lead dog! Father: Mr. Johanson, the sled looks great. We're very grateful. Rosy: [runs back inside] Oh, thank you, thank you, thank you! Mr. Johanson: [chuckles] So I gather. Father: I dunno, honey. I still think we should've gone with the dollhouse. Rosy: It's the one-mile marker! C'mon, Jenna! Let's win this race! Mush! Mother: Oh, I think she'll learn to like it. Rosy: I'm sure Jenna would love to have you on her team. Father: Hey! Rosy, stay away from him! Father: He might bite you honey. He's part wolf. Rosy: Now you hurt his feelings! Dixie: Good morning, Jenna! Otta be a close race, don't yah think? Maybe even neck, and, neck! Sylvie: Say something about her new collar before she gets whiplash! Jenna: Um, Dixie, what a pretty collar! Is it new? Dixie: What, this old thing? Yeah. D'You think, uh, Steele will notice? Jenna: I'm afraid the only way Steele notices anyone is if they're wearing a mirror. Star: Steele! We're going in circles! Star: Ah-h! Circles is a good thing. I mean they're, uh, they're circular! Steele: Didn't make the team, Bingo? Boris: Don't look at him. Don't listen to him. Liva long life. Boris: But you can call him "idiot". Boris: What, this wolf business again? And what's wrong with being half-and-half, I ask you? Sometimes like crazy, I wish I was half eagle. Boris: Better profile, for one thing. And no one eats you for another. Muk: What are you talking about? Of course he's glad to see us! He loves us, don't you? Boris: [sighs] Okay, okay. Hey, boichiks! Let's play a game. Race you to the shore! One, two, three--go! Luk: Help! Help! We can't swim! Help, help! [Boris and Balto run to where Muk and Luk are screaming] We're drowning, we're drowning! Save us! Balto: Easy, Boris. You know how they are. Muk. Luk. Relax. Hey come on! You're not drowning! Muk: (translating Luk's whimper) Oh, the shame of the polar bear who fears the water, no wonder we are shunned by our fellow bear. Woe is us! It's what he said, kind of pathetic, really. Boris: What? More whimpering? Between you and Balto it's like Dostoyevsky novel out here. Lighten up. Balto: I have the keys to the city. [expertly disables the door's hinge and pushes the door open] After you. 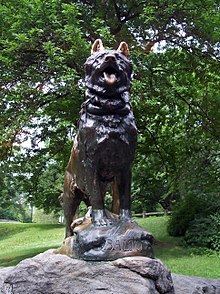 Jenna: [admires Balto's paw, very impressed] Balto! Balto: [laughs awkwardly] Uh... big paws kinda run in my family. At least.. uh, one side of my family. Balto: Dogs travel for miles just to be right here. Jenna: I can't imagine why. Balto: It's because you're looking at the bowl half empty. See these? [walks towards broken glass] These are the Polar Ice Caps. Jenna: Balto, those are broken bottles. And they're not half empty, they're all empty. Jenna: The Northern Lights. Oh, you're right, Balto. This is beautiful. Balto: [looking at Jenna] Yeah. Beautiful. Father: [Referring to Rosy, who is not well] Doctor, how is she? Dr. Welch: [disappointed] Exhausted from coughing, her fever's getting worse. Looks like diphtheria. [sighs] She's the 18th case this week. And I'm out of antitoxin. Dixie: What's with you, Jenna? Steele's a genuine hero! But do you even give him a sniff? Sylvie: That's because Jenna is running with Balto. Sylvie: She was seen in the boiler room the other night with Balto. And they went in together, and they left together, and I heard it all from a very reliable source, and don't bother to deny it. Jenna: Well, then I won't. Boris: Luck? I don't wish you luck, I wish you sense! [Quietly] Good luck, kiddo. Steele: Okay. Nikki, Kaltag, Star, gear up. We're heading out. Balto: Wait a minute, Steele. I was the fastest dog out there. Steele: You were the fastest...what? If you think any musher in their right mind would ever put you on their team...well, you're more mixed up than I thought. Jenna: Steele! It doesn't matter who's on the team! As long as the medicine gets through, stop being such a glory hound! Steele: You're a hundred percent right, Jenna. I--I wasn't thinking about those children. The im-important thing is to get the medicine through. And that's just what I'm gonna do. [Aside, to Balto] And when I come back, I'm gonna fold you five ways and leave you for a cat toy. Musher: Let's take a look at our winner, here! [Steele stomps on Balto's paw, causing him to growl in pain, baring his teeth] Ah, we can't trust this one. He's part wolf. He might turn on me. Nikki, Kaltag, Star! Someone else in the background: [Referring to Balto's teeth] See those teeth? Balto: [depressed] Don't come to close to me, Jenna. I might turn on you. Jenna: What?! Polar bears that can't swim?! Nikki: Ooh. I hit my head on somethin'! Kaltag: Balto, how did you find us?! Steele: [angrily enunciating] Everyone. Is. Fine. Star: Yeah, but our musher hit his head! And he didn't get up. Dog: And he's not movin'. Balto: [takes up the sled harness] Alright, follow me. I can lead you home. Steele: [stops him, hostilely] We don't need your help! Nikki: Well...how would you get us home? Steele: [abrasively crushes the tree and confronts him] I'll get us back. I'm the lead dog. I'm in charge! Balto: But... Then, let me take back the medicine. They're getting sicker. Steele: [jumps between Balto and the sled] Touch that box, and I'll tear you apart. Nikki: [betting with Kaltag] Two bones: Steele takes it. Kaltag: [accepting the bet] You're on. Balto: [firmly] Steele, I'm not leaving without that medicine. Steele: [angrily pushes him away] Who do you think you are? Kaltag: Ooh, he'll feel that tomorrow! Nikki: I think he's feeling it now! Kaltag: Hey, that can't be legal! Nikki: [shocked] Hey, that stuff is fragile! Star: What's with Steele? All Balto wants to do is help. Steele: Of course, as you know, I swam and I swam. It was freezing cold. And finally, I said "Steele, you just have to gnaw your way to the surface," so I-- [hears Balto howling outside] What? Star: They should build a statue of him! Kaltag: [Star flinches, thinking he'll be hit again] You said it! Part Dog. Part Wolf. All Hero. The true story of an American hero. His story became a legend. His adventure is one you'll never forget.